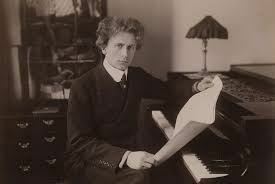 Percy Aldridge Grainger was an Australian-born composer, arranger, and pianist. Over the course of a long and innovative career he played a prominent role in the revival of interest in British folk music in the early years of the 20th century. He also made many adaptations of other composers' works. Although much of his work was experimental and unusual, the piece with which he is most generally associated is his piano arrangement of the folk-dance tune "Country Gardens." Grainger left Australia at the age of 13 to attend the Hoch Conservatory in Frankfurt. Between 1901 and 1914 he was based in London, where he established himself first as a society pianist and later as a concert performer, composer and collector of original folk melodies. As his reputation grew he met many of the significant figures in European music, forming important friendships with Frederick Delius and Edvard Grieg. He became a champion of Nordic music and culture, his enthusiasm for which he often expressed in private letters. In 1914, Grainger moved to the United States, where he lived for the rest of his life, though he travelled widely in Europe and in Australia. He served briefly as a bandsman in the United States Army during 1917–18, and took American citizenship in 1918. After his mother's suicide in 1922 he became increasingly involved in educational work. He also experimented with music machines that he hoped would supersede human interpretation. In the 1930s he set up the Grainger Museum in Melbourne, his birthplace, as a monument to his life and works and as a future research archive. As he grew older he continued to give concerts and to revise and rearrange his own compositions, while writing little new music. After the Second World War, ill health reduced his levels of activity, and he considered his career a failure. He gave his last concert in 1960, less than a year before his death.